This page includes reports of visits and photos taken during 2015. Visits included the 4 official BirdLife Melbourne Birding and Boneseeding days on 7 March, 6 June, 3 October and 5 December. 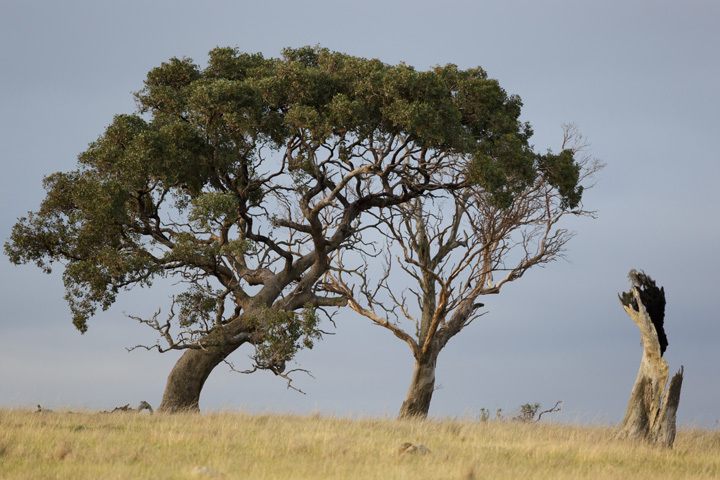 For information and images added in other years please see the relevant pages, You Yangs 2016, You Yangs 2014, You Yangs 2013, You Yangs 2012 and earlier. For plants see You Yangs plants. 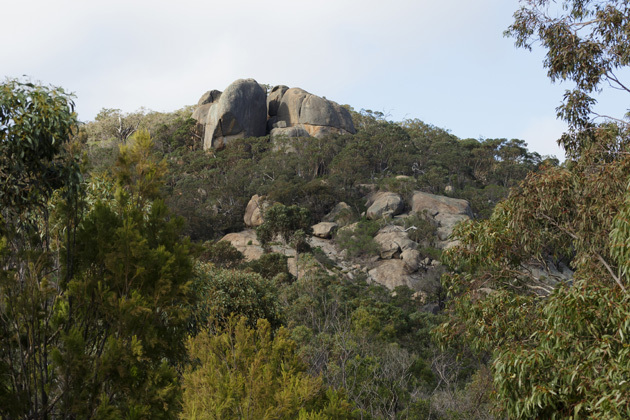 For general information about the You Yangs see the You Yangs page. On a warm day that was not quite as hot as expected, seven participants began the visit as usual near the park office and dam. An eerie lorikeet-silence indicated the absence of these birds. Often the air is full of their shrieks. However, it was not a complete silence because wherever we went Rufous Whistlers, Weebills, Brown-headed Honeyeaters and Grey Fantails did their best to occupy the sound space left by the missing lorikeets. We recorded a total of 40 bird species, even though we again neglected to visit the Eastern Flat / Seed Garden east of our boneseeding site. The park is extremely dry at present with some trees suffering as they did last time there was a severe drought. 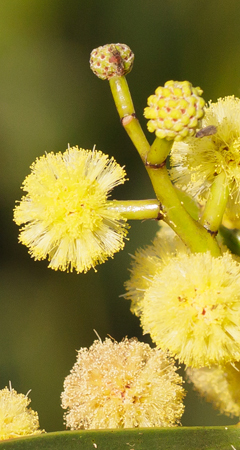 Various eucalypts were in flower, however, with numerous butterflies and other insects attending the blooms. Many of the dams are empty, though some still hold water. Despite the dry conditions there was plenty of evidence of birds breeding, shown through active nests or the presence of fledglings. Our boneseeding site still looks good. We pulled out some large boneseed plants north of our site, but left some of them there for next time. The large plants take a bit of effort to remove, but we persist. Along paths and a disused vehicle track where once there were boneseed plants, Drooping Cassinia Cassinia arcuata plants are taking over. Interesting. They do well in disturbed areas. 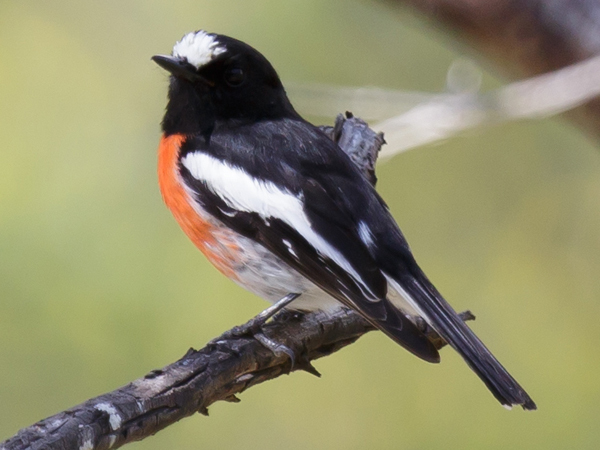 The BirdLife Melbourne You Yangs birding and boneseeding days are usually held on the first Saturday of March, June, September and December. This year, the Sept visit was postponed to the first Saturday of October. Because Friday 2 Oct had been declared a public holiday (for the first time) in honour of the eve of the AFL Grand Final in Melbourne, our boneseeding day was yet again on a long weekend. The day was peculiarly warm for this time of year and also windy, which is not so unusual for October. The 13 participants followed the general plan of birding near the Park Office and dam, Gravel Pit Tor, Fawcellt's Gully and our boneseeding site, but we also added a new location. This was a former sand-mine area (between the Park Office and Gravel Pit Tor) with pools of water that were being used by bathing birds. We will include it in future visits. Most of the YYs are very dry at present and if it does not rain soon, the water at the sand-mine area will no doubt evaporate. At our official boneseeding site we spent an hour or so pulling out weeds, including both boneseed and boxthorn. After that, most people were ready to leave, so we did not venture to the Eastern Flat / Seed Garden, which is usually our last birding spot for the day. However I had been there the day before when I visited to check on conditions before the official outing. 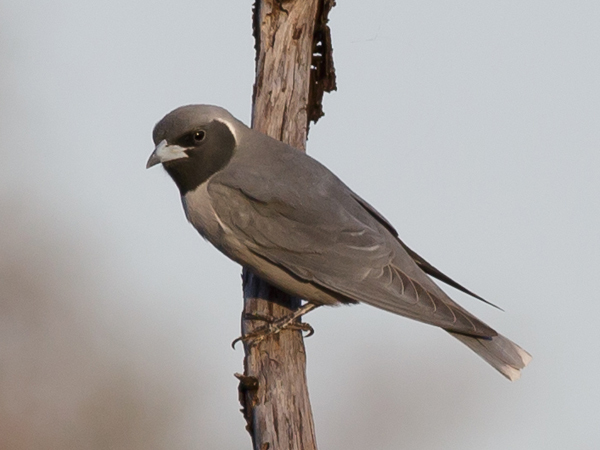 I was pleased to find a mixed flock of White-browed and Masked Woodswallows there and on the Saturday, a large flock of mostly Masked Woodswallows streamed over our site just before the last of us left. What a wonderful sight and sound. On our outings we do not restrict ourselves to bird watching. 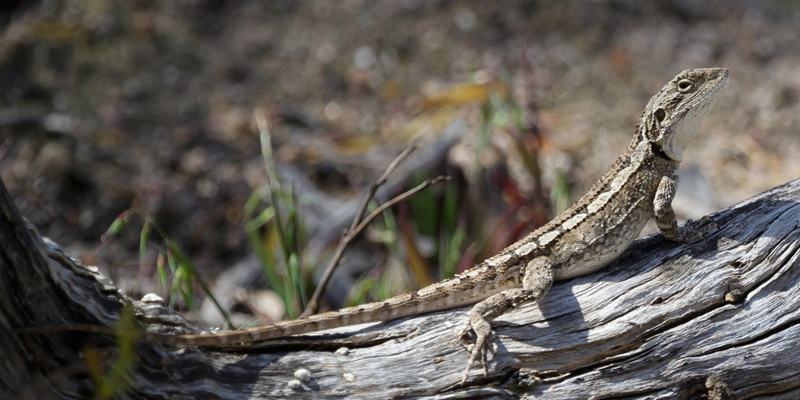 This Jacky Lizard posed for some time. 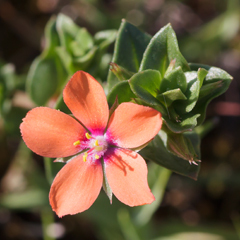 Scarlet Pimpenel Anagallis arvensis. This low-growing plant, native to parts of Europe, is probably often overlooked except when flowering. 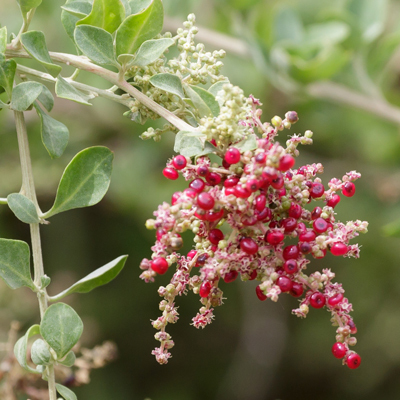 It is widespread and said to be toxic to various animals. We regularly see Scarlet Robins in the Gravel Pit Tor area. 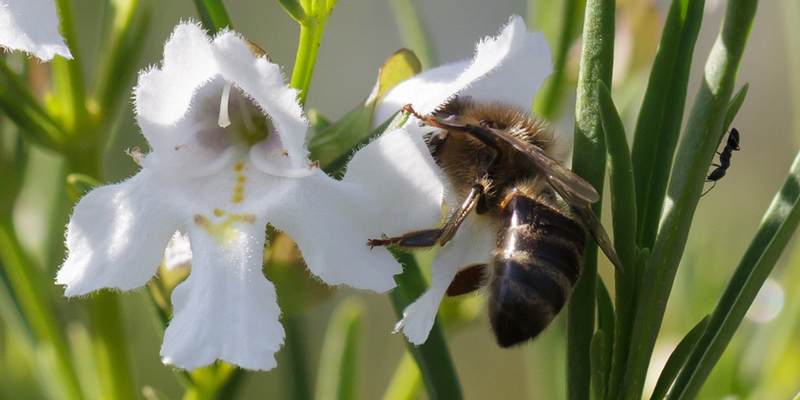 Snowy Mint-bush Prostanthera nivea, bee and an ant on the side. 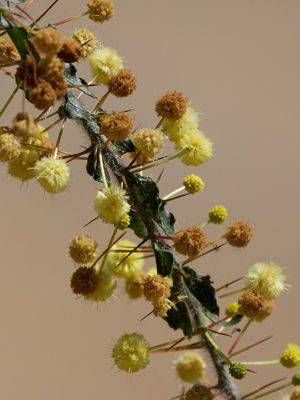 This plant is widespread in the You Yangs. Unlike other mint-bushes, it is not aromatic. BirdLife Bayside is well known for conducting outings on days when the weather is favourable for birding. This was no exception. It was cloudy during the morning, but quite calm. The cloud thinned during the day and by late afternoon the sun was shining with a soft light. At the start of the visit we met at the park entrance, then drove along Sandy Creek Road and spent some time in the western side of the park, where there were also people riding horses. Back at the Park Office area after morning tea, we were impressed with the number of honeyeaters feeding at the profusely flowering eucalypts. 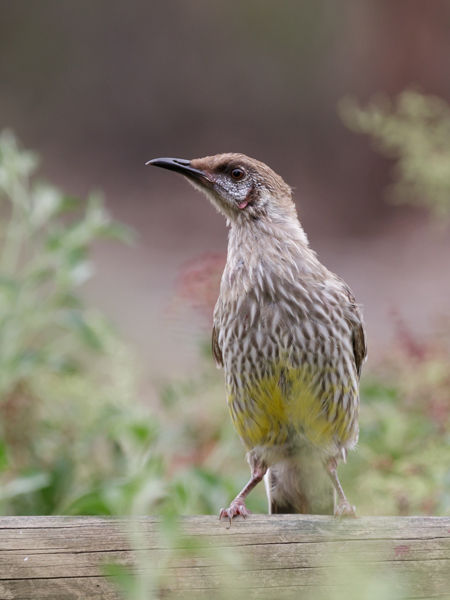 Fuscous Honeyeaters were still there as were New Holland, White-naped, Black-chinned and Red Wattlebirds. There were also numbers of Purple-crowned Lorikeets feeding and calling as they darted from tree to tree. After lunch at Yellow Gums, we drove around the Great Circle Drive, stopping at Gravel Pit Tor and at the beginning of the Branding Yard Trail where Toynes Road ends. We walked to the Bunjil Petroglyph, travelling rather fast for birders, and past Bunjil to the area of dams (or were they originally gravel pits? ), which were mostly dry. Last time I visited here there was plenty of water, but now there was only one small puddle left. Many birds took it in turns to bathe there. The eucalypts were flowering spectacularly and birds fed on them constantly. We saw our first Mistletoe bird for the day and numbers of Eastern Spinebills. The final bird count was about 52. We also pulled out boneseed plants in several places, hoping to make a slight difference. 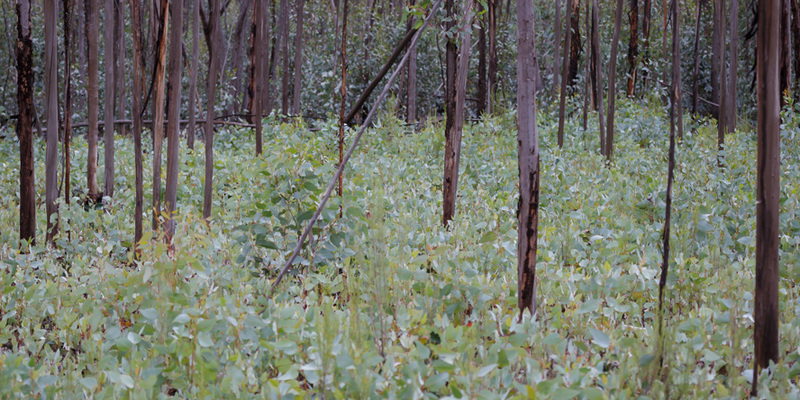 Dense regrowth of young eucalypts on the western side of the park, apparently after burning in the area. 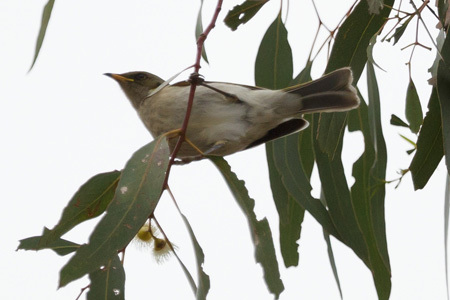 Above: The Fuscous Honeyeaters were hard to photograph against the white-cloud background. This was the best I could do. It's recognisable, at least. 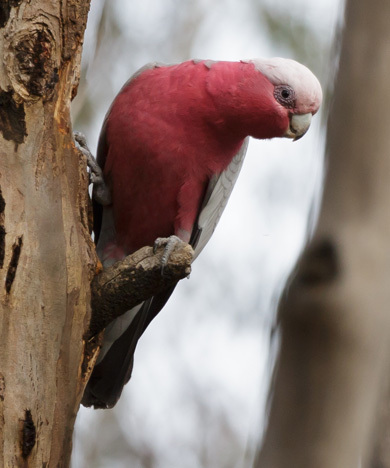 Left: Galahs were working on the bark of a eucalypt not far from the entrance area and dam. 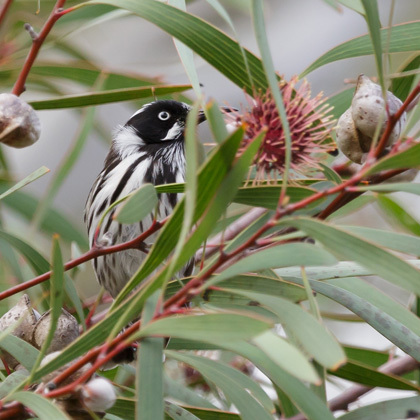 Above left is one of the abundant New Holland Honeyeaters that were feeding on Pincushion Hakea Hakea Laurina. Flowers are pictured in different stages on the left and right and some of the woody fruits can be seen on the left. These plants near the entrance area are flowering very well this year. This is not a local species. 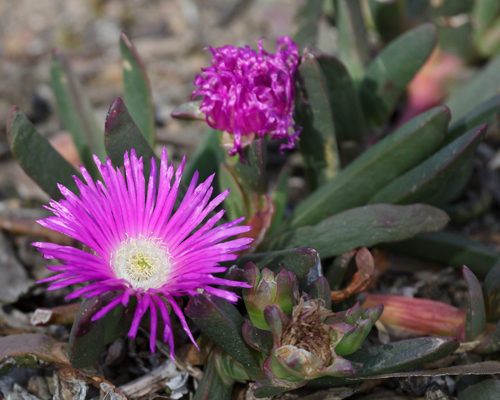 They grow naturally in south-western Western Australia, but are grown widely in other parts of Australia and overseas. 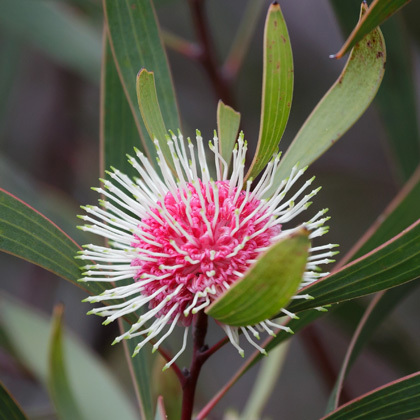 This is the third June in a row that I have included photos of this Hakea species in my YY pages. They are hard to pass by without taking their picture. Goats viewed from the Gravel Pit Tor area. 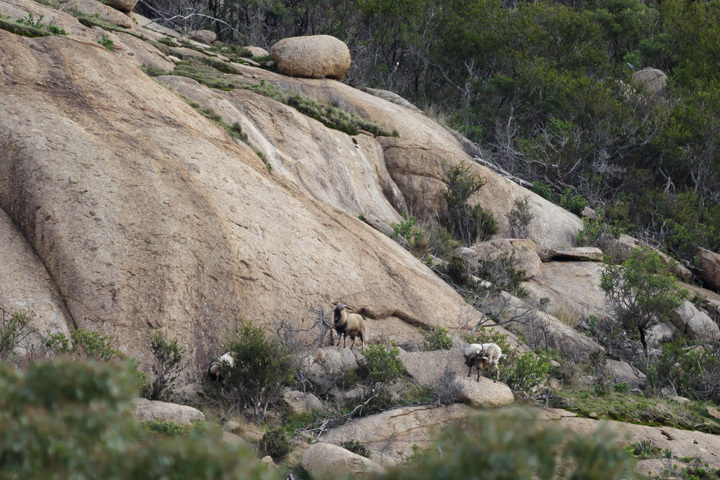 They could be heard bleating loudly as they moved about on the rocky hill side. 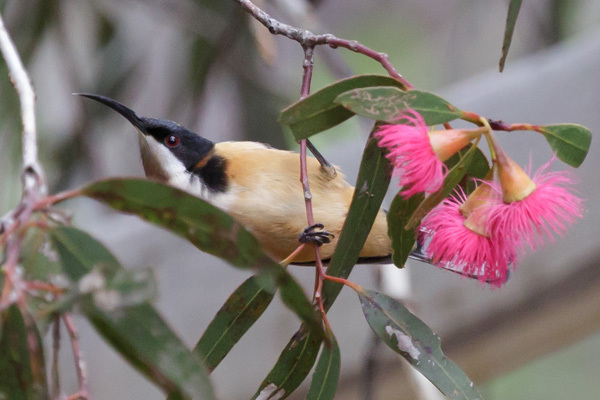 Eastern Spinebills were feeding on flowers along the Branding Yard Trail. 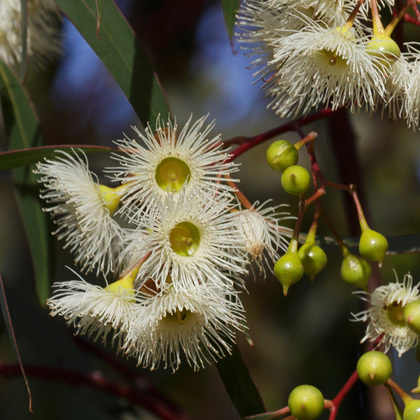 The eucalypts (or similar) were flowering profusely along the Branding Yard Trail past the Bunjil Petroglyph. 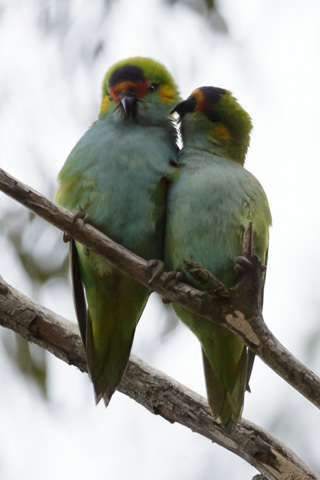 A pair of Purple-crowned Lorikeets spent some time preening each other near the dams or gravel pits past Bunjil. We had good views of them, but photography was difficult against the pale sky late in the day. Trees on farmland to the east of the park and north of Toynes Road viewed late in the day. After birding near the Park Office and in the Gravel Pit Tor area and having lunch at Fawcett's Gully, we headed for our official boneseeding site, where most of us spent our time pulling out boneseed near a dry creek bed in the north-east. Some did a wider search for the rather difficult, though less abundant, boxthorn plants. They fight back. We finished the visit by birding in the Seed Garden / Eastern Flat area. 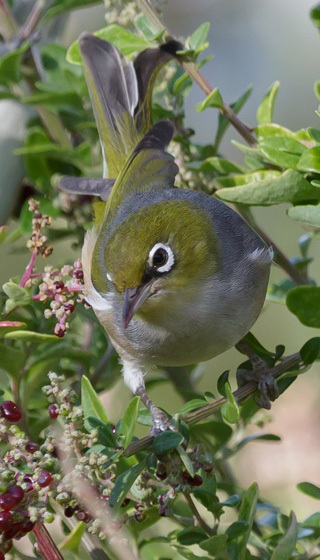 Silvereye; a flock was busy feeding on Seaberry Saltbush Rhagodia candolleana. These plants are in fruit for a long time; see below. 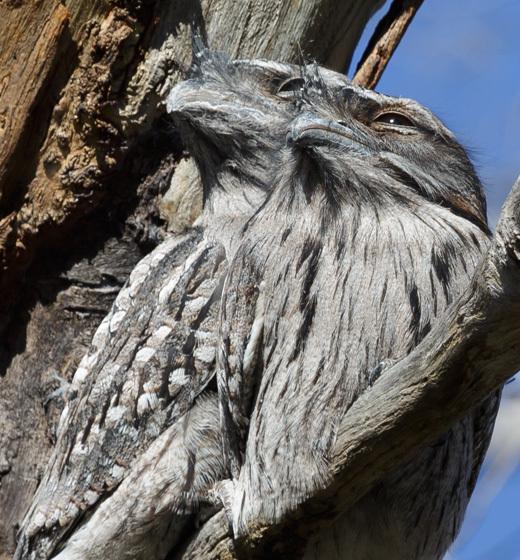 Two of three Tawny Frogmouths seen in the vicinity of the Park Office on 30 May, but not on 6 June. This year these birds are more elusive than usual; they seem to change their perching tree frequently. 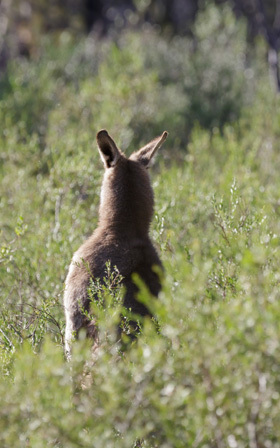 Eastern Grey Kangaroo not far from the park entrance, looking the other way, but ears pointed back towards us. 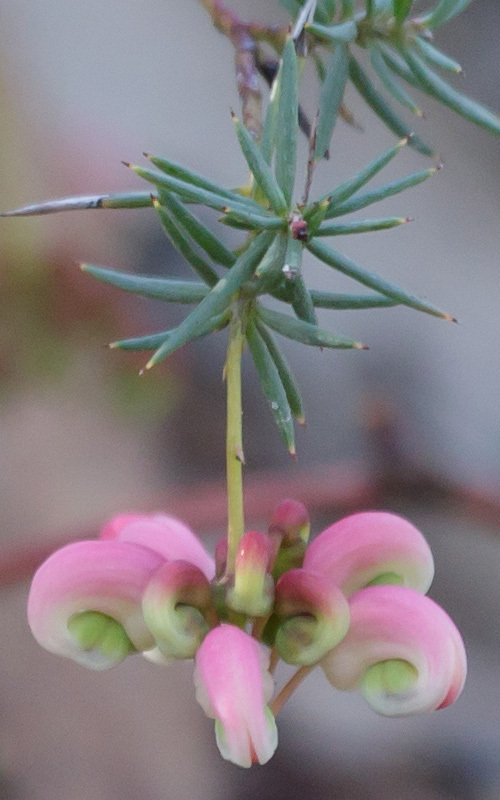 Pink Grevillea in the Gravel Pit Tor area. I don't know what species it is. If anyone does, please let me know. 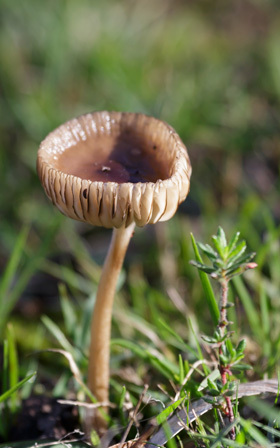 Fungus growing in the Gravel Pit Tor area. I needed help identifying this. My fungi advisor told me that it looks like a Collybia species, with the dark edges to the gills indicating brown spores. 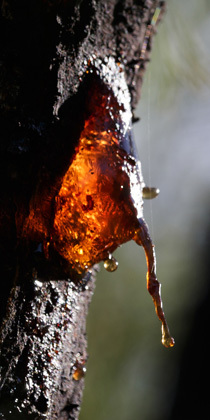 Acacia sap dried in the shape of a face on the side of a trunk...if you use your imagination. The eyes protrude and the nose is rather long. Gravel Pit Tor area. 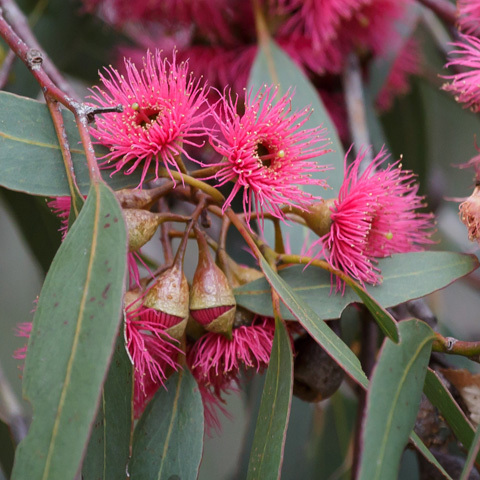 Eucalypt flowers and buds in the Gravel Pit Tor area. 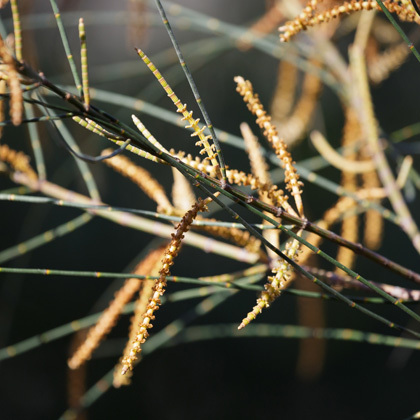 Male flowers on drooping sheoak Allocasuarina verticillata, Gravel Pit Tor area. 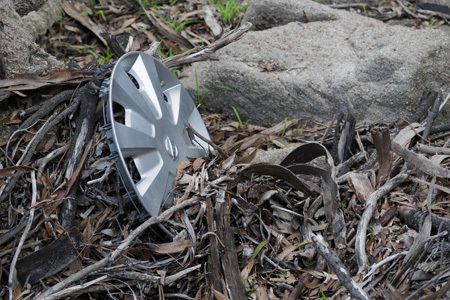 For some years a hubcap has been working its way down a normally dry creek bed in the middle of our boneseeding site. It still looks in good condition. Presumably it started near the road to the west and moves along whenever it rains enough for the water to flow. This obviously does not happen very often. Eastern Grey Kangaroos and Sulphur-crested Cockatoos on farmland to the east of the park. This was a quick visit on the way past. 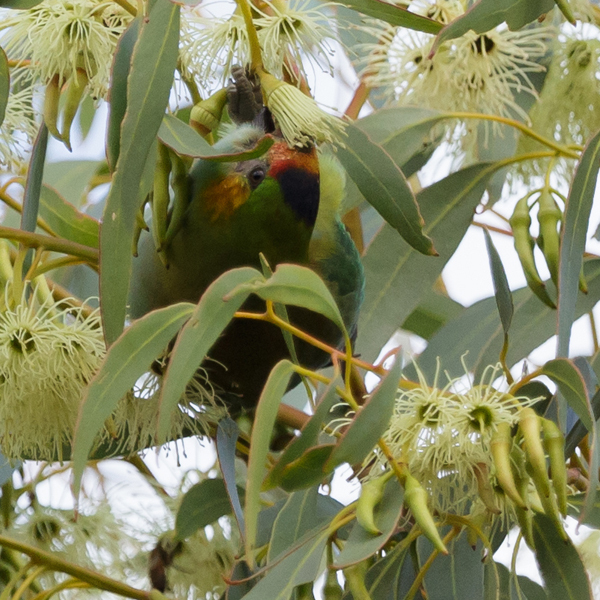 Purple-crowned Lorikeets were zitting about and feeding on eucalypt flowers. I still can't find the Tawny Frogmouths that are normally somewhere near the Park Office. The head of the above Purple-crowned Lorikeet looks oddly the wrong way around, but the bird is foraging upside down. One of its feet can be seen at the top. Rainbow Bee-Eater was one of the first bird species that we saw and heard on our BirdLife Melbourne early-autumn Birding and Boneseeding visit. 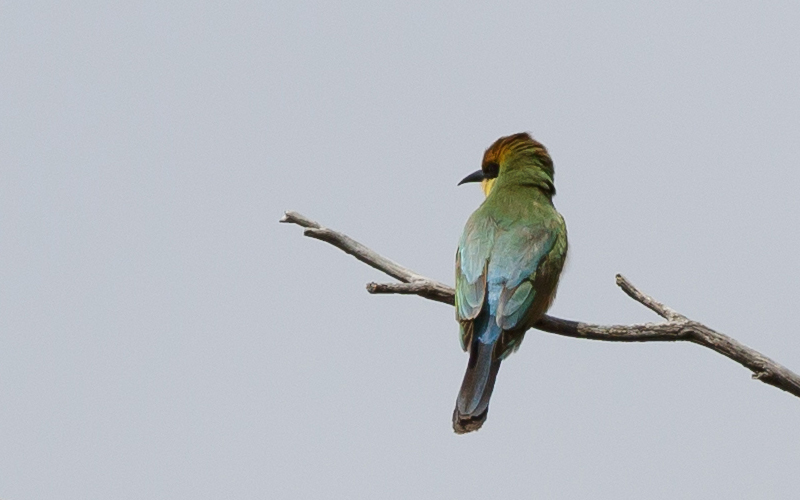 The bee-eaters called and flew straight over our heads. This time last year numerous lorikeets of three or four species zipped through the air and stopped to feed at eucalypt blossoms, but this year we saw none; nor did we find the Tawny Frogmouths that are usually near the park office. We did see numerous small and interesting birds, however. 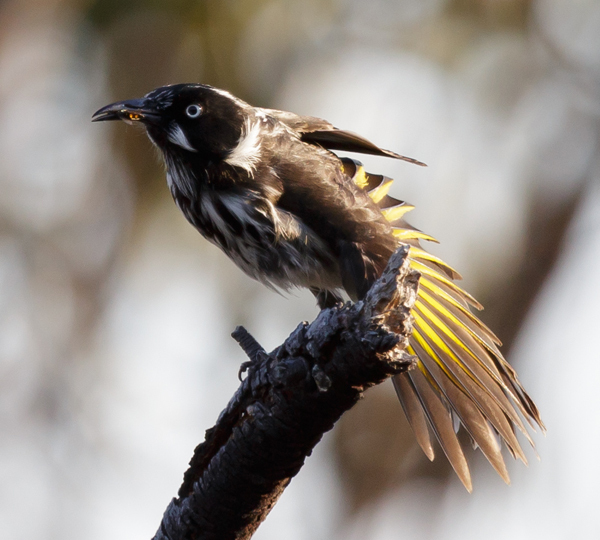 Among them were four thornbill species, honeyeaters, robins, Jacky Winter, Mistletoebird, and Diamond Firetail. 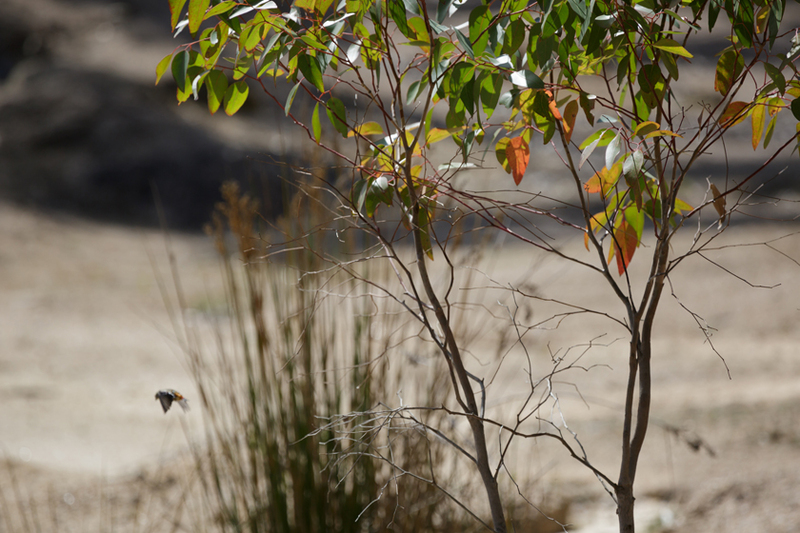 A full list is on the BirdLife Melbourne website. This year's March visit fell on a long weekend, but despite this, 11 people attended on the day. Thanks to all for your company and good work. We pulled out numerous boneseed plants to the east of our official boneseed-control area, where a new bike path is under construction. The main part of our site remains virtually boneseed-free. 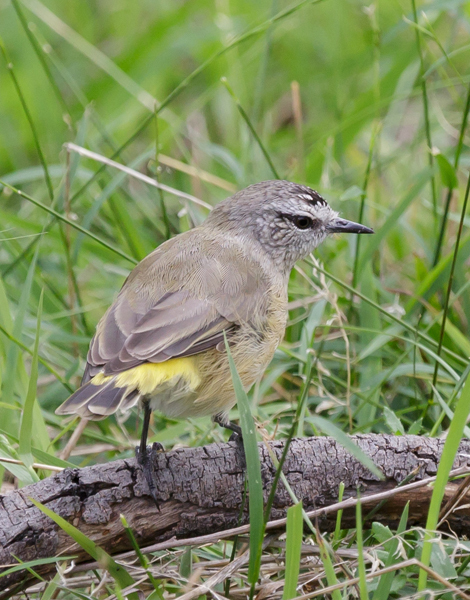 I have sent a more detailed report of the visit to the BirdLife Melbourne Blog. A Rainbow Bee-Eater perched with the sun shining on its back. The tail shafts are missing; either they have broken off or the bird is young, but it seems colourful enough to be an adult. 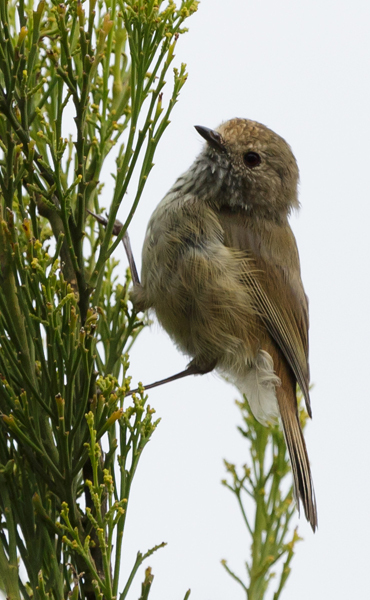 Buff-rumped Thornbill, one of the four thornbill species that we recorded during the day. Photos of birds of the other three species appear below under the heading 2 March 2015. 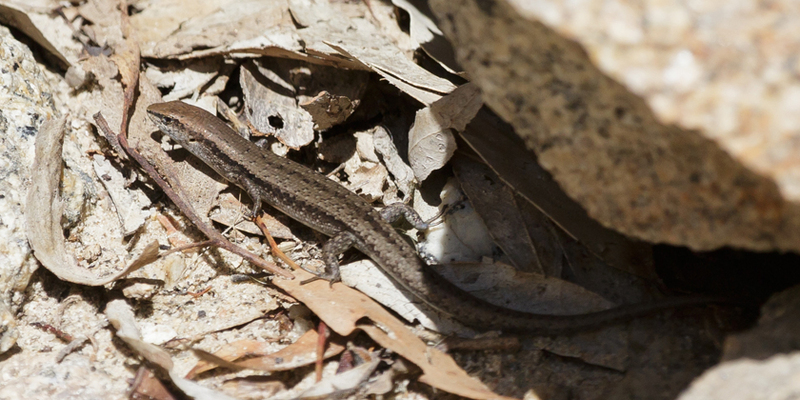 A Garden Skink Lampropholis guichenoti sunning itself between protective rocks near the Park Office. This visit was made in order to check on conditions before our next BirdLife Birding and Boneseeding day on Saturday 7 March. I could not find the Tawny Frogmouths that live near the Park Office. I did not see them on my last visit, on 21 Feb, though it was late in the day and I did not stay long, despite the lightning and thunder and rainbows. I did see three Frogmouths where I expected them to be on my first visit for the year on 18 January. Where have they gone to since then, I wonder. With more pairs of eyes we might find them next Saturday. Numerous Red Wattlebirds were feeding on Seaberry Saltbush Rhagodia candolleana berries in the fenced garden near the office. Several of the birds were young with barely a suggestion of the red wattles that with age will grow longer. For some time I stood by the dam near the Park Office, watching circular ripples and wondering what was causing them. Suddenly I realised I was being watched. 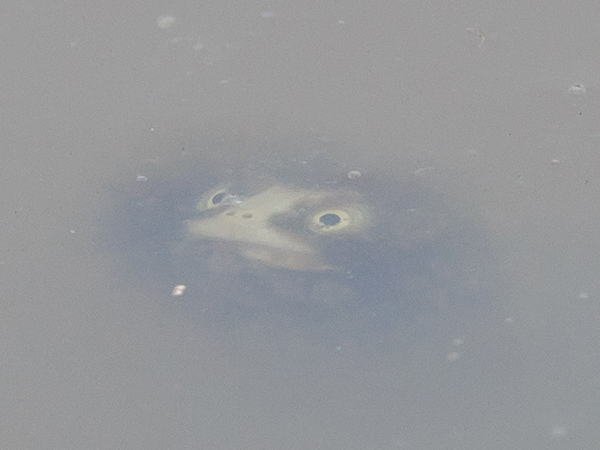 A tiny disembodied face appeared just below the surface of the water. It had large round eyes. It was quite a creepy experience. It reminded me of something out of a science fiction or fantasy story. Back to reality... I assume it had a long neck and a body and legs that were obscured by the murky water and that it was a turtle. 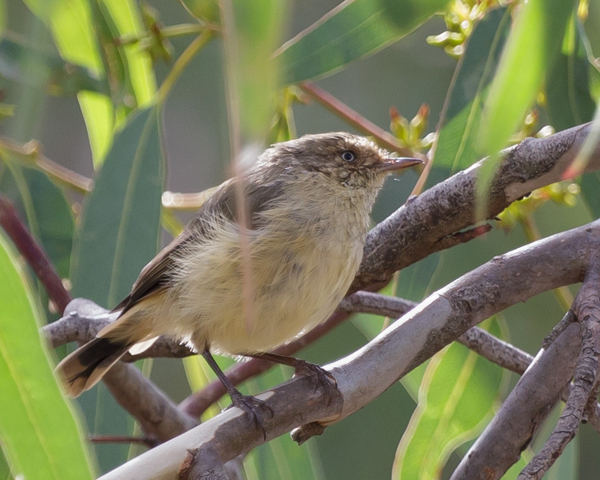 Thornbills of three species were foraging near the Flinders Peak carpark: Yellow Thornbill above, Yellow-rumped Thornbill below left, and Brown Thornbill below right. 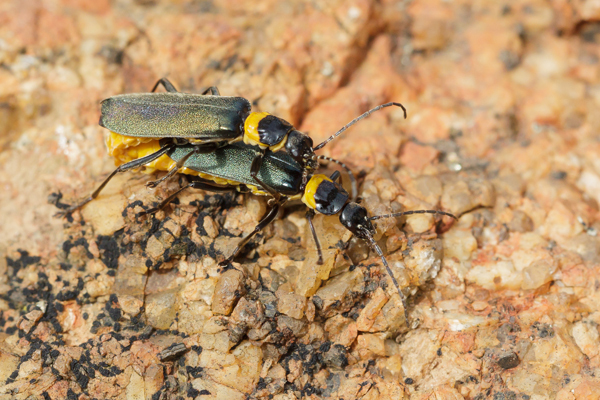 At Fawcett's Gully a picnic table and nearby rocks were covered (at least partially) with Plague Soldier Beetles Chauliognathus lugubris, nearly all of which were in pairs, mating (left). Those that I assumed were the males were noticeably smaller than the females, though otherwise they looked alike. Later in the afternoon I walked through our official boneseeding site, pulling out a few small boneseed plants as I went. I disturbed a large band of White-winged Choughs. They called with their beautiful mournful sounds as I walked by. Behind our site, past a bike path under construction, and over a new wooden bridge there is an ocean of boneseed plants. I think we might remove some of those on Saturday. To avoid peak-hour traffic on my way home, I stayed at the park until after 7pm and was rewarded with views of kangaroos as they grazed on short green grass. They looked up when I stopped on the road nearby, but continued feeding as I photographed them from my car.